Cho La Pass Trek is three in one trek in Everest region, one of the most popular challenging trekking track located in Everest Himalayan region of Nepal. This trek is covered three famous treks Gokyo Lake, Cho La Pass and Everest Base Camp, it is suitable for those who are seeking to explore the three supper treks zone in Everest region. 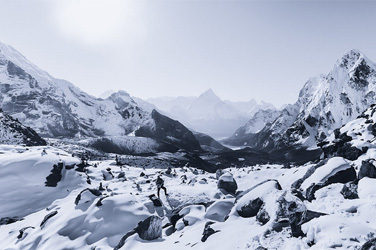 The Cho La Pass trek is also known as Everest circuit trek. The trek begins form the mountain airstrip at Lukla. It takes 30 minutes from Kathmandu to Lukla by exiting tiny aircraft. During the flight journey you will see the spectacular mountains views and green hills. After you will arrive at Lukla airport your guide will introduce with porters who will carry your luggage during the trek so you can give your luggage to him to carry. The trail passes through typical Sherpa villages, Gokyo Lakes, Old Buddhist monasteries and lush vegetation of Sagarmatha National Park. From Gokyo Valley you enjoy the bird’s eye view of Gokyo Valley, Gokyo lakes, Mt. Cho Oyu, Mt. Everest, Lhotse and Amadablam among others. After cross the demanding Cho La pass winds to classic route of Everest Base Camp and Kalapathar. Gorak Shep is the last teahouse settlement on the route to Everest Base Camp. From here, you can climb the Everest Base Camp (5364 meters) and Kala Patthar (5545 meters) viewpoint to witness the stunning panorama of world highest mountain range and glaciers . After visiting the Everest Base Camp and Kala Patthar, on the way, back the trek highlights highland monasteries like of Tengboche. Throughout the trek, it caters the scenic view of long mani-walls with sacred Buddhists prayers engraved on it. With all the memory gathered in mind, rest in soul and images in camera, we trek towards Lukla village and catch our flight back to Kathmandu. This day early in the morning we have a steep climb up to the top of Gokyo RI (5357m). There are stunning views of the Gokyo valley, the massive Ngozumpa Glacier and an incredible panoramic view of the whole Khumbu mountains range, such giants as Mt. Cho Oyu (8201m) Mt. Everest (8848), Lhotse (8516m), Nuptse (7879m), Makalu (8481m), Cholaste (6335m), Tabuche peak (6495m) and Gychung Kang (7922m). After enjoy the beautiful views at Gokyo Ri then return to Gokyo (4750m) overnight at teahouse.